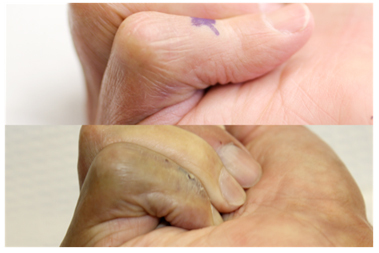 Purpose: Distal joint (DIP) hyperextension is a common problem in Dupuytren contracture. The Fowler tenotomy (1,2) releases DIP hyperextension by incising the distal extensor tendon. It may be performed open, or closed via needle tenotomy. However, the surgical trauma during its performance may create additional scar, which can lead to fixed contractures. Collagenase in small doses dissolves and weakens the distal extensor tendon, or previous scar, and allows for improved range of motion. Methods: Four patients with hyperextended DIP joints were treated with one or two injections of 0.1 mg of XIAFLEX (Collagenase) reconstituted in 0.45 cc of diluent at a single session. Average DIP hyperextension was 31 degrees with an average range of motion (ROM) of 32 degrees. Average follow-up was 4 months. Manipulation of the DIP joint under local anesthetic was performed to release the contracted extensor tendon and scar tissue. Results: DIP hyperextension improved from 31 degrees to 1 degree and ROM post-op was maintained at 31 degrees. There were no significant complications to this treatment of the DIP hyperextension. Summary: Chemical Fowler tenotomies with collagenase are useful in the treatment of Dupuytren contracture with a hyperextended, or scarred DIP joint. Hyperextension was lessened and flexion remained the same. This off-label use off collagenase allows hand surgeons a new way manage difficult problems in Dupuytren contracture. 1. Fowler, S.B., The management of tendon injuries. J Bone Joint Surg Am, 1959. 41-A(4): p. 579-80. 2. Dolphin, J.A., Extensor Tenotomy for Chronic Boutonniere Deformity of the Finger; Report of Two Cases. J Bone Joint Surg Am, 1965. 47: p. 161-4. ADDIN EN.REFLIST Figure 1. Hyperextension of DIP joint before collagenase treatment to the dorsal DIP area only and one-month follow-up. Figure 2. X marks the injection of 0.1 mg of collagenase into the dorsal extensor tendon and the result at manipulation.